A remarkable final position. Black has seven groups, against a single white group. JamesA: Aren't there two white groups there? I've marked the border in the black stones group. Dave Sigaty: Another remarkable point is the result. White won by 1 1/2 points. But realize that this means Black won on the board by four points before komi - despite having seven groups! HolIgor: Yes, Black can boast a good kill, however. Actually, the "joseki" Takemiya played in the top left corner was crazy. Karel? That's Takemiya for you - sacrificing an entire corner for outside influence. Who else in the Go world has balls to do that? And even winning, after all that. And to think that underneath that gigantic mess is a Takemiya-style Cosmic Moyo. It's really an creepy fight - I mean, they're fighting inside an area more or less surrounded by Takemiya, and it gives the whole fight that takes the last two thirds of the game a really weird vibe. This is one of the games which made me really worship Takemiya, though. 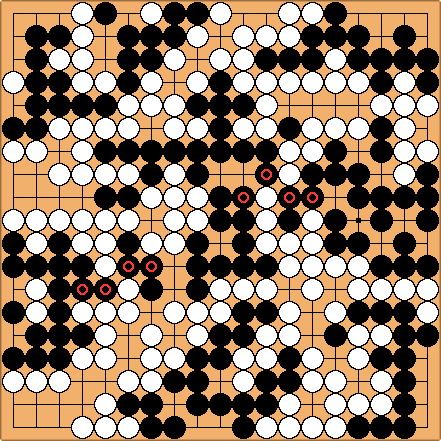 Once O Rissei spoiled his moyo, it's really frightening how his style changes - after that, it's like he completely abandoned the very idea of actually making any territory in the game, and instead, went on to make sure that his opponent wouldn't make any, either, hence the odd, spliced-up end pattern with seven different Black areas. It's really an incredible game - they ignore all these kikashi and leave half-finished shapes all over the board in order to play elsewhere. I don't suppose anyone would have a pro-commented record of this? Alex Weldon: Actually, the other day, I lost a game where I had a single group, and the opponent had six. Not quite as interesting as this, since I'm nowhere close to being a pro, but still surprised me. Dieter: In our national Go magazine, the commentator spoke about "Snow White and the seven dwarfs".